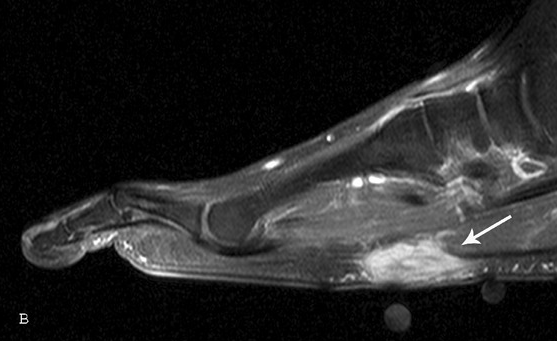 The identification of characteristics of plantar fibromatosis on imaging can greatly assist with the clinical diagnosis. 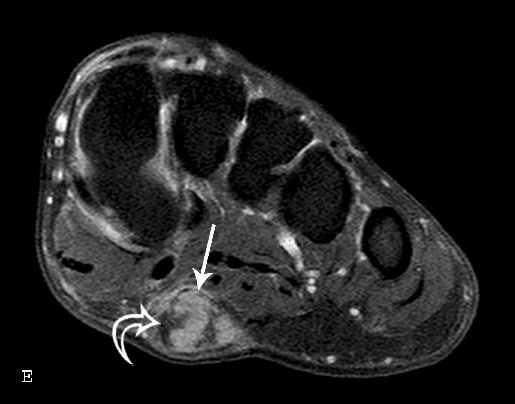 Cross-sectional imaging (ultrasonography, computer tomography, MRI) reveals the lesions location, extension and involvement of neighboring structures. Evaluation is therefore most commonly performed with ultrasound and MRI. 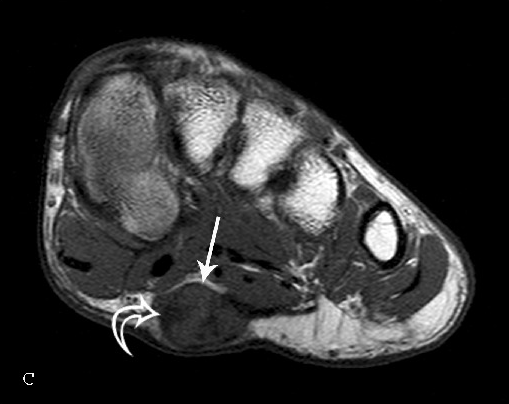 Sonographic imaging demonstrates a well-defined (64%) or poorly defined (36%) fusiform mass in the soft tissues adjacent to the plantar aponeurosis. 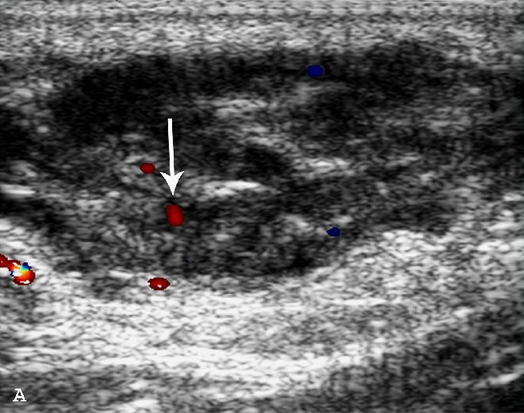 Figure 6: T1- weighted postcontrast fat saturation sequence demonstrate marked heterogeneous enhancement (arrow). During the first phase (1st-3rd day), the foot of the patient will be placed in a position of function. Mainly this phase will consist of: prevention of post-operative oedema by raising the foot and having the patient mobilize his/her toes. If postoperative immobilization is not provided, active mobilization will be required from the first day. The wound healing phase (8-15th day) will consist of: mobilization of the free articulations, circulatory and scar tissue massage (although there is only weak evidence for massage in scar management), lymphatic drainage, pneumatic/air pressure therapy, recovery of the joint capsulas, cartilage and muscles of the toes (slow and painless passive mobilization, active mobilization, work on the posture extension), ionization, lasers, ultrasound if there is a bad wound healing. 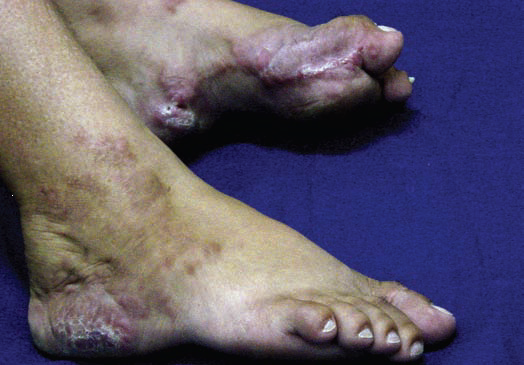 The phase after the wound healing will consist of: circulation and scar massage, bath of hot water or paraffin with active movements, total recovery of the articular amplitudes (by using analytic and global active-passive exercises and postural extension if needed with a dynamic brace), recovery of the muscle force (manually and later on with growing mechano-therapy appliances). There is minimal evidence to support the use of manual therapy to provide short-term (1 to 3 months) pain relief and improved function. 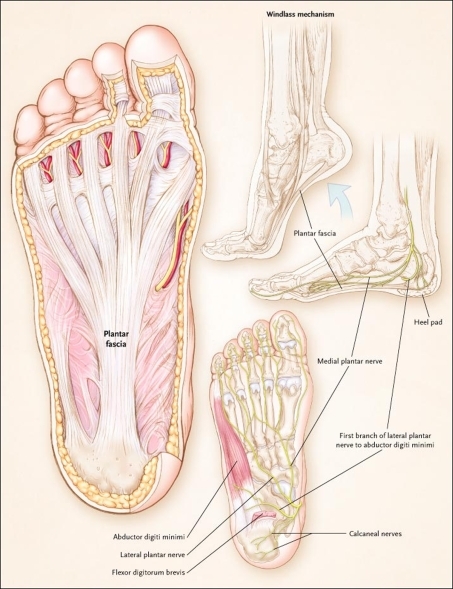 Suggested manual therapy procedures include anterior and posterior glides of tarsometatarsal, metatarsalphalangeal and interphalangeal joints.